China Eastern has become the latest Chinese carrier to take delivery of the Airbus A350-900 aircraft, which has been earmarked to fly select domestic services in China as well as long-haul routes to Europe, North America and Australia. The new aircraft is the first of 20 A350s the Shanghai-based carrier has on order. The aircraft is set to debut on the airline’s Shanghai-Beijing service with future aircraft set to operate routes to Chengdu, Guangzhou, Frankfurt, Amsterdam, Vancouver and Sydney. While China Eastern isn’t the first Chinese carrier to receive the A350 – both Air China and Sichuan Airlines already operate the widebody aircraft – the airline is notable for being the only one of the three to offer a first class cabin on the aircraft. In fact, few airlines have opted to give their A350s a first class offering. Malaysia Airlines became the first to do so back in November last year, but most other carriers have preferred instead to go for a two- or three-class set up that includes business, economy and sometimes premium economy. China Eastern, meanwhile, has gone for a four-class set up that features four first class seats, along with 36 in business, 32 in premium economy and 216 in economy. 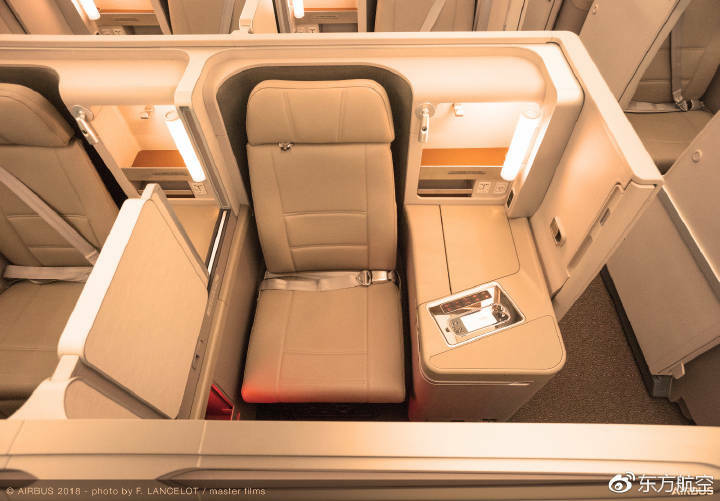 From images posted on the airline’s Weibo social media page, the business class seats look as though they offer an enclosed space with a sliding door. Seats appear to be laid out in a staggered, forward-facing 1-2-1 configuration. Another interesting feature is that the seat and screen controls are situated on the top of the side table in a receded design that, while looking sleek, may interfere slightly with the amount of table space passengers have to use. Seats also appear to have near-field communication (NFC) readers that could potentially be used for contactless credit card reading when making in-flight purchases. As for the cabins themselves, they feature Airbus’s Airspace design offering a quieter travel experience compared to many other aircraft. China Eastern is the second-largest operator of Airbus aircraft in the world, with 356 of the manufacturer’s aircraft in its fleet.